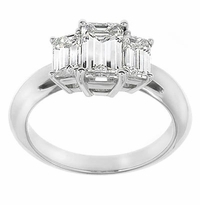 Our Three Stone Cubic Zirconia Anniversary Engagement Rings feature the finest lab created laboratory grown simulated diamond quality hand cut and hand polished original Russian Cubic Zirconia stones and have been and always will be a classic statement of elegance. 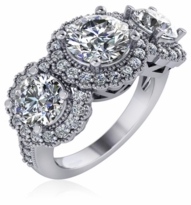 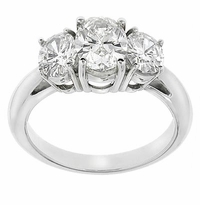 The classic three stone ring design typically represents your relationship's past, present, and future. 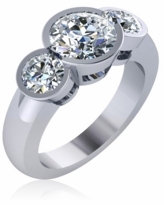 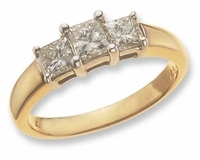 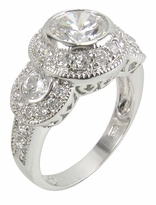 All three stones are individually set in a basket setting with four prongs. 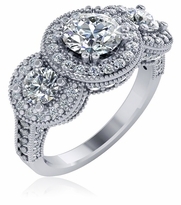 Each of our three stone rings are designed keeping proportions in mind. 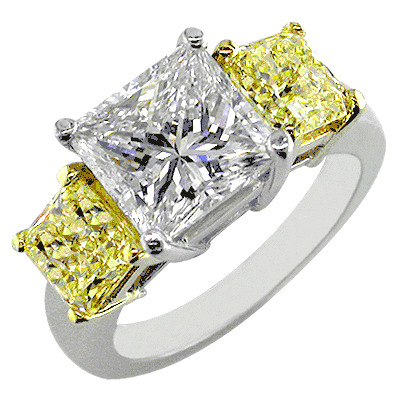 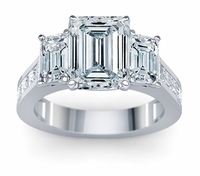 The center stone has side stones that compliment each other and not compete with one another. 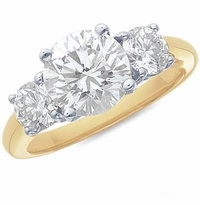 These ring designs are a staple in a sophisticated jewelry wardrobe and are perfect as an engagement ring, a wedding ring or a treasured anniversary ring. 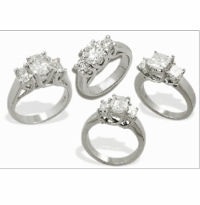 Items shown may be available in different color center stones or stone combinations that include man made red ruby, sapphire blue, emerald green in addition to lab created canary yellow diamond look, pink diamond look or white diamond look cubic zirconia. Available in 14k white gold, 14k yellow gold, 14k two tone, 18k gold as well as luxurious platinum. 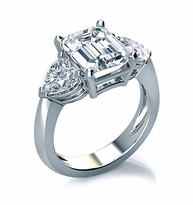 For further assistance please contact us directly at 1-866-942-6663 or engage us via live chat and speak with a knowledgeable Ziamond representative.